Catering Consciously uses only all-natural cleaning products, including re-usable bleach free towels, and all natural soaps. In addition, we use disposable, biodegradable, sugar cane and corn starch derived plates, cups and flatware. All food scraps and other products are then composted. Finally, we will then donate the proper, non presented food to various shelters and volunteer organizations. NORTHGLENN, CO – Catering Consciously, a Colorado catering service dedicated exclusively to an eco-friendly culinary experience, has been awarded the coveted Business Seal of Approval from Green America, the nation’s leading green economy organization, after undergoing an exhaustive screening process. With this designation Catering Consciously becomes the first and only Colorado company in the Restaurants/Clubs/Catering category listed in Green America’s prestigious National Green Pages, The Directory of Products and Services for People and the Planet. Catering Consciously focuses its entire operation on sustainability and green concepts, featuring menus consisting of local, organic, seasonal and sustainable food products, and ensuring that each occasion it caters is a No-Waste event. The firm employs recycling in all of its work-flow, and composts all of the scraps from preparation and from dinner plates at the end of the meal. Catering Consciously even hosts its website in an eco-friendly manner, utilizing Beanstalk Solar Hosting of Denver. Founded in 2008, Catering Consciously is operated by chef/owner Matt Busker, 36, who learned the cooking arts and the need for sustainability over the last 15 years in a number of fine Colorado restaurants, chief among them the renowned restaurants Larkspur in Vail, Samplings in Frisco and Mirabelle in Beaver Creek, where he served as Lead Line Chef, Chef de Cuisine, and Sous Chef, respectively. Green America, launched in 1982 as Co-Op America, provides economic strategies for a green economy, organizing power and practical tools for businesses and individuals to solve social and environmental problems. The not-for-profit organization’s mission is to harness economic power to create a socially just and environmentally sustainable society. Full information can be found at http://www.greenamericatoday.org. Are “values-driven,” as well as profit driven. Are committed to employ extraordinary and innovative practices that benefit: 1) workers, 2) communities, 3) customers, and 4) the environment. 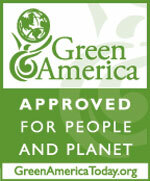 The Business Seal of Approval from Green America is the second major green honor achieved by Catering Consciously. The Winter 2008 State of the Green Union report from GenGreen LLC featured Catering Consciously for its “exemplary efforts in environmental and social responsibility,” a rare mention among the group’s more than 60,000 listings considered a high honor in green circles. GenGreen, based in Colorado, aims to be the most comprehensive and diverse resource available for people looking to live a locally focused, environmentally conscious lifestyle. For more information on GenGreen visit http://gengreenlife.com/sotgu_winter08.php. Catering Consciously provides full-service, eco-friendly catering to weddings, as well as to corporate meetings, reunions, parties and events of all types. In addition, chef/owner Matt Busker specializes in being a personal chef for meals prepared in a client’s home, and also as a complete chef on back country outings, where he will plan the menu, shop, organize, pack, cook, and discard the waste at the end of each meal. For details on Catering Consciously call 970-485-4970 and visit http://www.cateringconsciously.com/. PRESS CONTACT: MATT BUSKER, CHEF/OWNER, CATERING CONSCIOUSLY 970-485-4970. Westminster, Colorado – GenGreen™ featured Catering Consciously LLC on www.GenGreenLife.com, in their Winter 2008 State of the Green Union report. This exclusive article is only released seasonally, and highlights developing trends in the environmental movement while recognizing a select group of independent businesses and service providers that are demonstrating these positive trends across the country. The Winter 2008 edition focuses on the following trends: Gifts that Keep On Giving, Sustainable Soirées, and Planet-friendly Getaways. GenGreen recognized Catering Consciously for their exemplary efforts in environmental and social responsibility. Being named one of the featured businesses in the State of the Green Union report is a highly sought after honor. Only a select few are recognized each season. GenGreen LLC, headquartered in Colorado, is the most comprehensive and diverse resource available for people looking to live a locally-focused, environmentally conscious lifestyle. For more information go to http://gengreenlife.com/sotgu_winter08.php.